I’ve kind of thought that even if you hate the idea of Auburn claiming additional national titles that it has as much a right to as anyone, you’d surely at least be able to appreciate what it would do to Bama fans. I mean, here’s this team, this fanbase that has made you hate the number 12, and then the number 13 (is it 14 now? ), that for years has lorded its magically-doubling national championship record over God and everyone as proof of its southern football paternity… and we could raise that glorious 1913 flag and be all 1925? Please… WE WERE THERE FIRST. But it’s so easy to forget that there’s a generation of Auburn fans that already knows that feeling. Read it again. One more time. 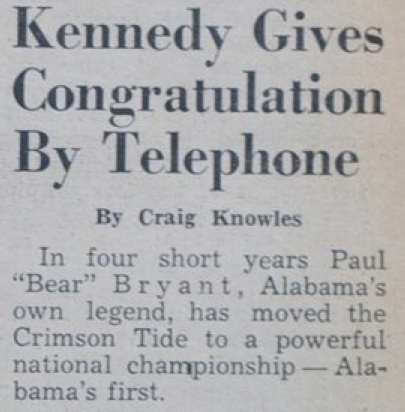 According to Alabama’s student newspaper, Bama’s first national championship, in the minds of folks celebrating it in the moment, came four years after—not 32 years before—Auburn’s first national championship. The first time in history, 1961. The story ends by acknowledging the SEC teams named AP national champs before Bama. HELP TWER KEEP ON KEEPIN’ ON. Where are the source documents for this? Is there a way to get a full duplicate of the issue or something? As you can imagine, there are LOTS of people that need a copy of this.